Navaratri 2016 is starting from tomorrow, Oct 2nd. People keep Golu and do pooja to Godesess and also offer sundal and sweet as neivedhyam. Daily we make one Sundal and one sweet during Navaratri. 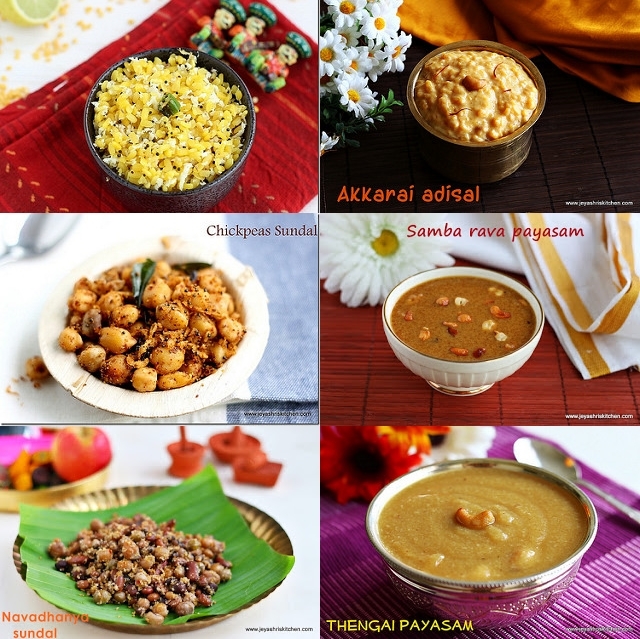 I have alreay posted a Navaratri Combo menu, for guests, in my cooking for guests series. This post comes with an idea on what to make for neivedhyam on each day of Navaratri. I have just made a combo to give an idea. Feel free to alter according to your preference. check out my sister's post on how to keep Navaratri Golu . Before going on to this post, let me tell you few general rules we follow during this festival. The spice powder which we make for sundal, should not be made in bulk and used. Once you do neivedyam with that podi, the next day you can not use the same for neivdhyam. You can use it up in curries or sambar. Once the food is offered as neivedhyam, it should not be altered even salt is less or spice is more or sweet is less.. no alterations recommended. Check out my complete list of navaratri recipes. Also Check out my complete collection of Navaratri Sundal and sweet recipes. Click on the name of the recipe to get the link for the full recipe. Wishing you all a very happy Navaratri . Let this festival brings abundance of joy, health and wealth. Generally we make puttu on friday and ellu urundai on saturdays. Apart from these many people make ulundu vadai, aama vadai , puliyodarai, ellorai, kesari, thayir sadam, panagam, modakam and nei appam for neivedyam.